Question 1 – What do forests and woods mean to you? As a forester, forests and woods are simply my life. I have been very privileged to be in a position which has allowed me to work with trees and help discover attributes of trees in realising sustainable solutions to urban problems; in particular their extraordinary abilities to help remediate substantial damage caused by development. The amount of knowledge we gain with regards the importance of trees is growing all the time, particularly as trees evolve in response to human activity. Question 2 – What is your vision for the future of England’s forests and woods? England’s forests and woods cannot be isolated from those in neighbouring countries. The threats are common to all and as trees are not subject to national boundaries, policies should not be also. The English population have been very stoic and patient and allowed the Forestry Commission to develop to a point where it is now simply essential, (although name changes and merging with Natural England makes sense). 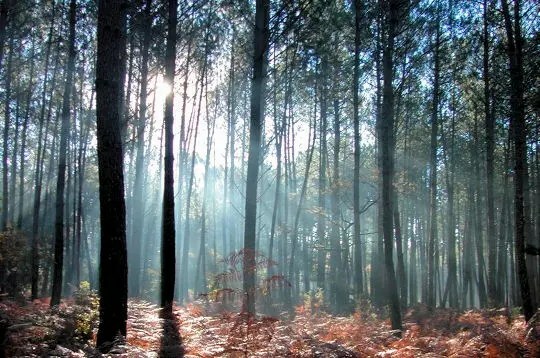 The UK was one of the leading countries in the actual implementation of Sustainable Forest Management (SFM) and as such is closely watched from abroad. Any regressive proposals will have ramifications beyond English or even UK boundaries. Thus a governmental agency born out of the FC, with an increased remit beyond the rural landscape would be desirable for the security of all trees beyond national boundaries. 1. The landscape belongs to the people and the people to it; the European Landscape Convention is a tool for policy makers to relinquish some burdens on any centralised authority and will also save costs as it is cheaper to create policy with the local population than introduce and revise according to local objection. 2. Practitioners and contractors in both forestry and landscaping sectors are disenfranchised. There is a huge base of skills and knowledge which can help to protect against pests, diseases and non native invasive species. The UK forestry and landscaping sector is still largely made up of smaller businesses that provide socio and economic advantages to all local communities. Empowering them by way of using them to help thwart threats is vital and again cost saving. 3. The management of trees and woodland is not confined to national boundaries but localised ‘earth and social sciences’ create factors that mean that centralised ‘one size fits all’ tree planting and maintenance guides are ineffective. Given that all new woodland creation is deemed good, no matter for what purpose from game to carbon, it must not be allowed to fail by ignoring localised factors. Further blanket designations do not work, a library of knowledge for site specific planting to ensure success exists – use it. a) you personally; They provide an income and a landscape for me to be utterly content with my life. b) society as a whole; The health and welfare benefits are under rated, in many urban / peri urban environments the ‘underground’ root and soil relationship creates a scenario which can almost be deemed symbiotic with human lifestyle. We are yet to fully understand just how important trees are to all animals including humans. c) the natural environment; Trees are an emblem of the natural environment. They create the natural environment, even when they disappear the detritus left helped create the majority of non sylvan natural habitats worth conserving. d) the economy; A sustainable future can only be realised through the use of timber, both as a construction material and an energy source. Question 4 – We would like to hear about your suggestions of practical solutions and good practice which can be replicated more widely. I answered some of this in Question 2. I would like to be reassured that the work and research, both by the Forestry Commission and others is fully assimilated by the forestry panel. I would also like to reassured that relevant academic research both UK and European is absorbed into decision making. As in France and elsewhere diversification is as important in forest management as it is in agriculture. It is vital to encourage private forest owners to seek solutions to achieving Multi Functional Forestry, beyond the somewhat limited boundaries of a heavily conservation based land management sector. For example; we know that hunting, for right or wrong, will gain disapproval – yet it is a need to help control pests. The new and fast growing leisure activity ‘bushcraft’ is a possible source of both revenue and a solution to pest management. Engaging with the forest as well as barbequing a grey squirrel / rabbit is surely a win- win situation for both landowner and community. The challenges are the current and future threats to all trees and woodlands. The sectors responsible for the spread of pathogens must be held to account more; for example in a bizarre paradox some elements of the horticultural industry have actually been criticising forest management trying to halt the spread of P. Ramorum. We need continued and enhanced research as the priority. A strong but little published connection we have with our trees and woodland in Western Europe is through alcohol. It is hardly confined to Europe and most primitive and modern cultures will have a spirit made from an indigenous tree. Arguably the most prevalent spirit in Western Europe is ‘Plum Brandy’. Most French ‘Eau de Vie’ is made from plums, Slivovitz in Slavic countries and many other states have a variety of spirit made from plums. Commercially plum brandy is hardly a top brand, but the easy distilling process allows for huge domestic production. Straight it is a potent drink and is responsible for many new friendships and new emnities, promptly forgotten about the following day. In France it is illegal now to buy or sell domestically produced eau de vie, but its production is still rife and is very much a part of the landscape. As described in Sheila Dillons wonderful radio 4 broadcast. This year has been an excellent year for all our plum trees; in our village I have counted up to 32 different plum varieties the most prized of which are the mirabelles. I had been looking forward to finally having enough plums, from various varieties to have some of our own eau de vie produced, but some of the trees border a road and in the dead of night were stripped clean, as were most of the wild plum trees in hedgerows around the village. Whilst very angry, I had to accept the point that living where scrumping was the only crime is hardly a bad thing. It reminded me of Roger Deakin’s pleasure in discovering he had poachers in the woodland he had planted. There was of course an additional factor in this, as with most other British expats in France it is difficult to become accustomed to rights and privileges enjoyed by generations in rural France, which have no grounding in modern laws. The production of eau de vie is a family matter and recipes are dependent on particular quantities of fruit from particular trees. These trees are revered by families who may have no ownership rights at all. The distillery in the village which produces eau de vie is just one stage of the final production of the regional speciality Pineau. Once a family has had their favourite melange of plums, often with quantities of other fruits thrown in, (cherries, raspberries, sloes and even the fruit of the Wild service tree – a particular favourite for me), the resulting eau de vie is mixed with grape juice, the resulting taste is similar to a very sweet sloe gin. Nestled in between the wine growing region of Touraine and the Cognac vineyards, (which often produce their own commercial Pineau), there is effectively no ‘commercial’ drink available, and thus the domestic Pineau rules in the Sud Vienne, when eaten with the local cheese Chabichou you experience the landscape itself at its pinnacle as the production processes have been refined and refined to reach the most optimum taste in the here and now. France is well known as a country which identifies its landscapes with taste and hospitality thus dictates that any visitor must sample the taste associated with the landscape they visit, the combination of tastes offered reflecting not only the natural heritage but the socio economic circumstances of that landscape also. Is this the result of a country more culturally progressive than the British Isles as is often quoted? I would argue not, that it is the reverse. 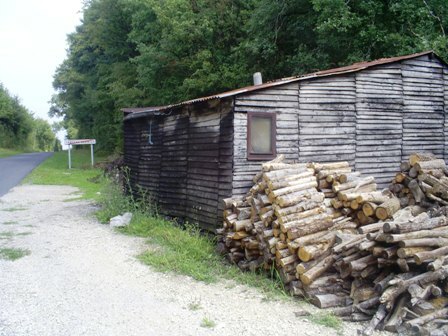 The historic poverty of the French provinces was acute and much of the cuisine is the result of a need to use the landscape to its optimum – sustainability by default. The UK in comparison for much of history has been an extraordinarily rich country and the loss of regional tastes is the product of centralisation, capitalism and thus progression. No wonder Napoleon referred to the English as a nation of shopkeepers. But in modern terms and in the need to discover sustainable progression for rural UK, it is surely time to look at traditional French systems as a method to help re establish localised cultural heritage across the board. Of course this has already started, local fruiting tree varieties are sold out year on year, there are many new small businesses experimenting with various foods and drinks using the local landscape as a source and rapidly discovering new yet perhaps ancient tastes of real wonder. Having got into the habit of referring back to the UK forestry panel I feel I must disappoint, (asides from perhaps a suggestion to install distilleries within UK woodlands to help people re connect with their landscape), so instead ‘cheers’. Damage to Infrastructure by Tree Roots. Arguably the single largest myth affecting Tree professionals, is the misconception with regards the extent of damage caused by tree roots. It is a misconception that has also entered the archaeological / heritage sector, with much blame levied at past plantations being planted too close to archaeological remains. Little research actually exists, (proportionate to the huge quantity of variables to be considered) and whilst there is in existence many ‘guidelines’ these fall well short of actually being useful at all and certainly should not be used by the insurance industry or others as definitive. In reality the situation on the ground is far worse and the myths with regards tree root damage are culpable of a huge amount of wrongful insurance decisions, unnecessary tree removal and also the spreading of a fear towards trees which is now widespread throughout suburban UK. In my experience both in the UK and in France, (there is a huge difference in practice between the 2 countries), I have never come across a situation where a tree root is directly responsible for damage to a built structure. I have seen many examples where the lack of necessary and often legally obliged maintenance to structures has resulted in providing a niche in which tree seeds have been able to propagate. I have also come across many examples where the soil profile left in a garden or plot for landscaping following construction work is dangerous in itself and thus subsidence and other problems occur, which would have occurred without landscaping and planting, yet the latter receive the blame. The hard truth is that tree professionals, (and they are professionals unlike many who feel they can contradict or ignore their advice), are left to pick up the pieces and yet should have been involved from the outset of planning and even with regards architectural design. There is also at play a huge missing link in the processes of development in the UK. Further to the above the abuse of soils during construction is endemic and as unsustainable as it can get, even on so called sustainable development projects. It has reached a stage where you will simply not find a site where the soils have been remediated as they should be subsequent to development. Indeed you can hold the UK up as an example of using phytoremediation and bioremediation practices at all times – this is by default – the result of efforts by a poorly paid landscaper or forester who has no budget to do anything more than plant and hope for the best and in a bizarre paradox; the trees, which are ultimately blamed for future problems were actually the one factor that helped to alleviate that problem for many years previously. The ‘Landscape Architecture’ industry has done much to lessen such problems but without real governance and legal framework to deal with the issues, the costs involved shun good practice in favour of cheap practice. The Arboricultural Association are amongst one of the best accreditation organisations in the UK , but despite the best of efforts in tackling poor journalism and general misconceptions by larger industries this is a battle little recognised beyond the arboricultural and forestry industry itself. We continue to see the placing of untrue facts via the media into the public domain. At present many of these untruths are criticisms of now historic Forestry Commission practice. Archaeology, for which the UK has an obsession for, has been placed high up in the list of issues in relation to Multi Functional Forestry. I am not in disagreement with this, but some commentary on damage to archaeological sites by plantation forestry is somewhat overzealous. I know for a fact that many sites in the areas I used to work in in Argyll, the archaeological features were simply not even known about prior to initial surveys by Foresters. A wee digression: In Kintyre and Knapdale, a forestry contractor used to construct forest tracks had an understandable urge when discovering large rocks to up end the rock and leave a monument, which looked identical to many of the standing stones in the further landscape. It was a form of signature of his work. In one location he discovered several such rocks and the temptation to create a stone circle was too much. The subsequent report following the archaeological survey, (as part of the Environmental Assessment required for all large new plantations), a considerable chunk of proposed planting area was removed to create a buffer zone around the historic monument, constructed just a month previously. I have been to archaeological sites, which have subsequently been identified as having been damaged by roots, but there is absolutely no way this could have been possible, the distance needed to be covered by the tree roots was simply too far. I am sure there are locations where there has been damage, but they are rarer than the general public are being led to believe. The only times I have witnessed damage to sites of historic importance by tree roots it is as a result of natural regeneration of native trees. Is the protection afforded by the ‘strimmed grass’ land management regime found at many Englishh Heritage sites any worse than the weed infested open ground of an historic site found within a forest plantation? I have always been disheartened when visiting English Heritage sites to discover that from Neolithic time, through to WWII a strimmed finish is the fashion, a misinterpretation which could easily confuse most people. It is a real shame that a taste of the land management of the period of time when these sites were in use cannot be displayed and maintained. I would not advocate the French system, where the destruction caused by invasive species such as Robinia pseudoacacia, Fraxinus angustifolia or Ailanthus altissima remains largely unchecked and worse used as an example of ‘urban biodiversity’ benefit. There is a common ground between the UK and France and it would be easy to implement guidelines based on this. Is the power of the insurance lobby simply too big to fight, is there simply too much money at risk here? The current and ongoing UK situation however is bordering on criminal: Once in Devon, I had to investigate a case when an insurance company had refused to pay out with regards the subsidence of a garage; claiming an apple trees roots has caused the damage – the apple tree in question was more than 10metres from the garage, less than 10 years old and its roots had not even spread beyond a metre from its stem! As a continuing theme in my blogs, I am referring back to the UK forestry panel, whose remit will apparently cover all trees and woodland in the UK. One hopes that certainly in regard to new planting, the constant message from the Arboricultural Association, Tree Council amongst others will be incorporated into policy and measures to ensure ongoing maintenance and the implementation of good practice as identified by these bodies and the forestry and arboricultural industry at large will become a fixed standard. But with the quoted prices of tree planting and retention that are currently being offered as incentives, particularly with regards carbon offsetting projects, it is impossible to believe that everyone has yet understood these concerns and that there will still be a huge amount of tree planting to occur in the UK, without any budget for future and essential maintenance both to protect the trees and also infrastructure. Why the European Landscape Convention should be included in the debate re the future of UK forestry. Following on from the comments thread on Gabriel Hemery’s blog and also in answer to others’ asking similar questions as to why I and many others feel the European Landscape Convention (ELC) is such an important issue for UK forestry, asides from the more general examples of its implementation, I hope to be able to explain how ELC ideals and also how land management policies from a French / European angle would allow for a giant leap forward for UK forestry but the material to convey is simply far too much for a ‘blog’ such as this. But the ELC is perhaps the answer to the future of all UK forestry policy making in terms of assuring Sustainable Forest Management (SFM) and it can be argued that the ELC, whilst recognised, is a long way from implementation of the ideals and thus far in the UK has been little more than a tool to place further value on ‘beautiful rural landscapes’ rather than the English Landscape as a whole. Whilst the Forestry Commission have already published their ELC strategy: http://www.naturalengland.org.uk/Images/Forestry-Commission-elc-action-plan_tcm6-23574.pdf , there is no evidence at all that the forestry panel are to contemplate let alone promote the ELC. Landscape can and should be used as the all embracing definition for the full integration of every single element of land management, natural / cultural heritage and rural / urban social sciences in an external setting. But there is a problem; the acronym loving UK system, in play in all terms of landscape management and issues contains some who struggle to relinquish power they have gained to what I have heard referred as the lowest common denominator – the public and the practitioners. The ongoing fear that finances will be at risk has created protectionist mentalities within many organisations and many individuals, from Central & Local Government, Quango’s, NGOs and Large Businesses. The ideals of the ELC match those of ‘big society’, they fit all modern thinking re governance as well as Teeb ideals, they allow for the integration of all sciences involved as well as all stakeholders including the most important of all – everyone. There are many variables to consider, although the psyche of the average member of public / practitioner in different countries is often stated as the biggest block to following case study from abroad is I believe irrelevant and any statements by profiteering stakeholders (including the NGOs) referring to the psyche of the English in terms of connections with their landscape and elements contained within it should be ignored. The ELC approach starts at the bottom, as any policy making or management planning needs to commence with those to whom the landscape belongs – everyone. The European Landscape Convention is based on the fact that the European continent is in regards all earth and social sciences on a parallel, what happens in one country effects all. Europe is small, with many small countries and fragmented populations, we simply cannot ignore the fact that the boundaries are too difficult to police against natural threats, let alone climate change particularly when all landscape issues remain at the ‘bottom of funding concerns’, whilst at the same time the very rich cultural heritage of Europe resulting from the myriad of languages and cultures is a source of huge financial concern, if not more than via the tourists’ wallet. Secondly, for any Briton believing that the ELC is text drawn up by a gravy train passenger based abroad, it is important to remember that the principles of the ELC had a very strong UK voice and input throughout its conception. The so called ‘antiquarian’ planning system in England in fact held many ideals of the ELC within it. Additions and tinkering with planning has resulted in red tape which hide these ideals but recent moves to ‘simplify’ the UK planning system have tended to concentrate on breaking the original ideals rather than the additions installed by a desire to control the system to a particular advantage – which has been for a long time the development sector and will clearly remain so for a while. Consultation which begins with the public within the immediate landscape and then proceeds to explore each independent variable within a landscape is the only way forward. There will be many in the UK, working for Central and Local Government, Quangos, NGOs and industry who will claim this to be the case in the UK at present, the current call for input from all to the forestry panel is a classic example. But the truth is that this is nothing more than a token gesture, an easily manipulated exercise, which can do little more than highlight axioms which are no longer needed due to the fact the ELC has been ratified and has already absorbed all historical and recent commentary about peoples’ connection with their landscape into its text. Therefore the forestry panel is nothing more than a stalling instrument, enabling repositioning for good or evil to further profiteering. This is therefore where the UK falls down and seems unable to proceed alongside its European neighbours in terms of implementation of the ELC. In France and most other European countries the landscape simply belongs to people, all stakeholders take this fact on board. The paradox of the existence of the forestry panel is difficult to explain abroad – why with a government who so desire ‘big society’ should the future of an element of the landscape be decided in closed door meetings, with only large land owning or national NGO stakeholders stating what they want from a landscape that does not belong to them? Why when social media, which helped so effectively in displaying the dissent at the possible sales of public forests then be virtually ignored and not embraced in trying to find a solution suitable for all? Why and indeed how have landscape issues been pigeonholed to an extent where they are now seen as a separate new ‘wing’ within land management, leading to more designations and more organisations (as well as the obligatory muscling in by incumbent NGOs seeking to expand their power, sorry resource, base)? The most bizarre paradox of all is that with necessary cuts, the decision to further fragment (by increasing the coverage of representatives, centralising and moving offices) the government are culpable of damaging the already fragile links for big society engagement with civil service. If anyone, as many do, need professional help, that help should be found within their community contained within their landscape. Empower the practitioners further and there becomes a safety net to ensure the safe and complete transition into full sustainable land and forest management. This of course how it is played out in many European countries. Taking the threats from this years drought as an example: There were fears that it would be as bad as 2003, innovation by locals during 2003 saw many systems of water management introduced, from Heath Robinson contraptions through to the most simplistic of solutions. Academic study was added to the melange and subsequently associations and organisations did little more than promote these ideas beyond the local community and the result was that all could benefit from a host of local / peripheral knowledge, thus this year the old sage on his allotment plot was one of the true heros in enabling France to cope relatively well with what could well have been the worst drought it had ever experienced. Furthermore in terms of French woodland management the hunt is a key player. It helps to conserve and protect the woodland. In the UK the hunts face harsh opposition and the population are one that shirk from eating squirrels, rabbits and even deer. The solution is easy – the growing leisure pursuit of ‘bushcraft’ should be supported further and embraced by private landowners, a new generation of wannabe Ray Mears, will happily munch their way through the ever growing population of mammals posing a threat to new trees as well as conserving and re establishing traditional crafts and knowledge. We need to see full and transparent policy making, thus leading to locally interested people to come forward and represent their interests rather than their objections, the latter always leading to financial waste. We need to see all organisations, (and there are so many good examples to choose from), representing members interests being used alongside local people at all ‘events’ concerning a landscape. We need to see systems in place to halt the current ‘head above the parapet’ situation when a practitioner or private landowner seeks to further sustainable management on their land. The current situation simply leads to a mistrust of all Quangos’ and NGOs’ who seem unable to agree with each other and for someone like myself, a private practitioner, it is impossible to justify to a client the need to play host to a series of representatives in their various logo emblazened vehicles and fleeces assuming rights many do not have over other peoples property. Above all professionals need to accept the fact that those who attended ‘the university of life’ (a term to raise the hackles of many in the industry) have a relevant voice and further, many solutions. It is after all as much, or more so, their landscape than those deemed worthy to manage it. After trying to explain at length the economic importance and intricacies at play of the role of the UK volunteer in terms of forestry and countryside management to a French mayor, He stated that it was an impossibility to realise volunteers as stakeholders in a national sense in France ‘’A homeowner will happily sweep the pavement outside their property, but they are unlikely to do next doors’’. The volunteer is now a fixed commodity for many UK NGOs and in most cases they provide the platform to allow for strengthening conservation beyond the minimum requirements as well as providing a key to progressive land management and full integration of all stakeholders. I have been privileged to work alongside a BTCV team, on whose faces was displayed the full set of emotions that many of us lose when dealing with land management on a day to day basis. There was no doubt that the young team felt privileged to have the chance to spend one day helping and in return being given the connection with a landscape and the natural world that so many of those on the periphery of the industry take for granted (in my case constructing an otter holt in the grounds of a 4 star hotel overlooking the ancient woodlands that overhang the Helford river). As a practitioner who has worked in the private sector, my opinion on the voluntary sector is certainly an ongoing love / hate battle. In terms of progressing towards full sustainable land and forest management in the UK, they are a vital component and quite frankly good fun also. They have been a link for communication to the greatest of landscape stakeholders, the public. And my fond memories of days spent with fellow International Tree Foundation members, tree planting alongside hefty community turn outs, will stay with me as a raison d’etre for continuing my career. I have always and continue to feel that the voluntary sector has been abused in the UK, it has been responsible in part for the disenfranchisement and decline of the traditional and local practitioner. It has become a necessity for entry into the profession and diminishes chances of paid work in land industry to those who cannot afford to volunteer. It has arguably led to a shift in favour of middle class influence against both the higher and lower classes in all elements of land management. Most dramatically it has led to voids between landowning NGOs and private land owners, which has only been kept from splitting the landscape in two by dominant governmental agencies. There now exists a situation, in particular relating to the National Trust whose voluntary base is huge and can be undeniably stated as being the masters of the exploitation of volunteers, that some of the UKs cultural heritage is only preserved as a result of the omnipresence of volunteers and no one can question the importance this has for all of us. However in terms of general forestry and land management this is not always the case and as the corporate identity and role in policy making by some other landowning NGOs increases it is leading to unfair competition, particularly when the valuation of ecological systems gains recognition within politics. Private landowners must also be given the opportunity to gain from the valuable commodity that is the volunteer, and with increasing amounts of private landowners purchasing and managing land for more altruistic purposes and to realise sustainable land management, this notion cannot be disregarded as being one that would not appeal to the potential volunteer. On a local sense the volunteer can be part of the community to whom that landscape belongs. They would properly (and all case study suggests this) welcome the opportunity to engage directly with what may have been a previously closed element of their landscape. And given the choice of this option and volunteering for a large NGO whose executives are paid handsomely the chances of being or feeling ‘duped’ are considerably less. In terms of the practitioner base there now exist many European schemes, the best of which seems to be the Leonardo Di Vinci programme allowing students to gain experience of traditional land management crafts, which have all but disappeared in their own countries and yet due to much more broad spectrum and intense higher education courses in their own countries allow for a real transfer of knowledge. There is a possible very sad paradox to occur in the future, where the skills and knowledge of UK traditional practitioners will have been exported and embraced in other countries but allowed to die out in the UK. I once had a ‘stagier’ from the INH at Angers, who worked alongside a UK team in the Westcountry of England for only 3 months, but now integrates the skills, which are important and oft ignored elements of sustainable land management, learnt into private practice in France. Some of her colleagues had completely unpaid placements with UK landowning NGOS, and governmental agencies and did nothing more than strim grass verges for the 3 months. Volunteers are wilfully abused. There is an increasing amount of disdain held by volunteers for those who are charged to manage them. This is largely due to the volunteers simply being treated like an employee. If you feel like this, then seek out another NGO, there are many available or preferably a local group (in many parts of the UK small local groups meet regularly to simply enjoy a day of work – Steeple Woods project, the resulting achievements are far more rewarding than planting up a field for CO2 offset, paid for by a local business, which will be sold anyway). After all charity begins at home and volunteering in real financial terms is a hefty sum to give to any charitable cause. As the remit of the forestry panel for England appears to cover all trees and woodland in the country and the omissions on the panel have been questioned in terms of being able to fully embrace a sustainable forest management future, (as already mentioned in previous blogs: the lack of an academic, scientific, public or practitioner voice) it can also be argued that the voice of the volunteer is also lacking due to the fact that it will be muffled behind the barrier of those NGOs who assume to know all about the ‘voluntary’ sector but in real terms this knowledge is little more than knowing how to profit from them. Whilst we can now use the meaning of our landscapes to progress land management using the strength of integration between all involved, we need to remember that a tree represents far more. The intrinsic link trees have to us as people, their role in governing the most important factors for our survival as a human species one would assume is unquestionable. A tree may well be a simplistic image in landscape terms, one of a number of answers a child may give having been asked what is contained within a landscape. But a tree is both finite and infinite to us as humans when considering our own lifetime and it is thus arguably the most fragile and important elements of a landscape. To many from the policy makers and practitioners through to those who inhabit the most remote of forest scapes the idea behind having an ‘International Year of the Forest’ is a scary reminder of a lost connection – Have people really reached the stage where they need reminding of the importance of our trees and forests? To this the answer is clearly yes, the void of knowledge between the majority of the human race, particularly its ever growing urban populace and the progression of sustainable forest management as a necessary goal for the survival of mankind has been spreading for over 2000 years. It is a fact that historians have ignored trees, thus leading to general ignorance in terms of their significance and thus is renewed in each new generation of those destined to govern us. The ignorance of the importance of trees for previous generations is clearly evident through dendrological studies. There is also certainly an axiom that some religions have deliberately obliterated trees and forests from being celebrated in fear of the strength of trees significance to pre religious peoples and their power to disturb human influence over other humans. Despite this trees have always transcended all human boundaries placed between them and the people they provide life for. But this importance is habitually reinvented by generation after generation upon the discovery of facts within particular lifetimes. They are omnipresent features in the course of complete civilisations and can be the reason for their failure as on Easter Island. They are a primary study for new periods in the history of our own civilisation; the first great works of art, music and literature have embraced the form or attributes of trees as a necessity to prove the worth of the first wary steps in the progression of our cultures. Recent wars and subsequent economic process have resulted in huge losses to our forests, the rapidity of the economic growth as a result of the population growth have meant that the losses were simply too rapid to counter. Trees remain a vital non political and non religious entity, an antidote to changes in policy and governance. This has been persistently tested and the most recent PFE disposal furore in England was a simply yet another example of this and each time (yet to be seen through to its conclusion in the present situation in the UK), it is doomed to failure, relying instead on the taxation of veiled commerce to hide the realities of a global mistreatment of our trees internationally. We are now at a time when we see the various strands of land management and natural heritage starting to talk the same rhetoric, a time when the most ‘out there’ hippies can stand alongside the most scientifically minded academics in terms of what is needed for the preservation of both the landscape, the ecosystems contained within it, us and how we manage it, a time for sustainable land and forest management to take the stage easily. This new future is aided by the recent addition of international communication by way of social media. We can now celebrate the attributes of trees with likeminded people across the world instantly; sharing all new facts and information and governance requirements to rapidly our knowledge with regards trees. The void of knowledge is lessening rapidly. However it is important to never forget that at present our knowledge about trees is still minimal. Trees certainly evolve with us. Their adaption to human influenced landscapes has altered their family, species and individual characteristics in such a way as to render them in many minds to be impervious to the worst we can do as humans. However in the last 20 years we have started to realise this is not true as the damage to our soils and climate change equals too much stress on many of our trees. The complexity of a tree has led some of the greatest minds to believe there is intelligence within a tree. It is likely to be a collective intelligence formed by the myriad of organisms who share its fate. Underground the complexities increase and the first revelations of the role of fungi and their symbiosis’ with trees have simply led to the need for further research. There has never yet existed a person who understands trees completely. Given the enormity of what is at stake, the implications of climate change amongst other pressing needs, we as a generation cannot be the ones who halt the continued research into what is at present the tip of the iceberg of research into trees. The current situation in England is still under worldwide scrutiny and thus the pressure on the forestry panel is immense. Questions posed by the panel to gain the public opinion so needed are simplistic and perhaps they have to be when presented to a nation that have been forcibly distanced from their connection with trees. As stated in previous blogs the media is culpable for this disconnection and is now freely aided by a government who seem to believe that sustainable development is truly achievable because a complete society has been so greenwashed as to accept the most ridiculous of oxymorons, including sustainable tourism, sustainable fashion, sustainable cosmetics. 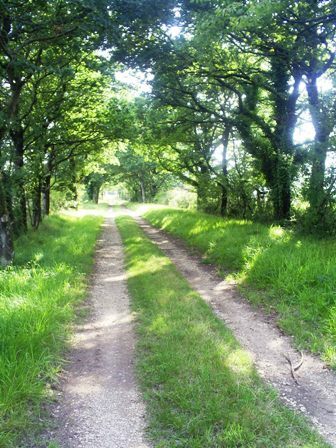 There exist many statements expressing the urgent need for restoring ancient woodland & establishing new woodland from the self acclaimed ‘largest tree and woodland conservation’ charity in the UK. There is and can be no urgency, it would be dangerous. There are pressing threats and we cannot allow our eyes and wallets to stray from them. These threats are global; pests, diseases and invasive non natives threaten the complex ecosystems of all our existing trees. Any urgent work to restore ancient woodland or plant new woodlands en masse could be as catastrophic to the delicate systems we do not fully understand as the global problems re climate change cited. Having worked with trees all my life, I am still discovering not just new discoveries with regards their physiology and their ecological relationships, but also new viewpoints every bit as vital. Two weeks ago I was lucky to meet the New Zealand artist Heidi Threlfo in Paris. Her work is a form of tree art, which whilst original harks back to our ancestors’ celebration of trees, connecting elements of their materialism with what they saw themselves as their ancestors. 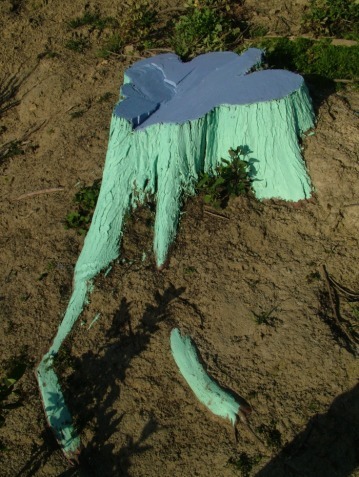 Further her guerrilla art, simply painting the stumps of fallen trees, was one of the most powerful yet subtle methods of haunting those responsible, making visible the ghost left behind. This work was most poignant to me in regards to what I hope is wrong and which I wrote about on the SOW site; the trading of trees for planning gains. The ‘location’ a tree grows in, cannot be replicated by the planting of even a hundred trees if removed. The soil is as vital to the tree as trees are to us. Displaced soil takes a very long time to recover and a huge cost. It simply cannot be traded. Heidi’s work showed what remained after felling and thus highlighted that the so often referred to scar left after a trees removal has an importance too, a value yet incalculable because we simply do not understand enough yet. Outside the UK the IYF celebrations have certainly caught many a collective imagination and the discovery of the pleasant repose found when diverting our minds away from politics towards our trees and forests is to many so refreshing as to become a necessary need. Regrettably in the UK the present generation have to start the process of rediscovery all over. The Forestry Commission are all but silenced and the practitioners have never been so disenfranchised. The forestry panel can pick and choose from a wealth of research, they can choose to halt certain progressions in favour of others and they are tasked with filtering what is at present over 30,000 public responses without a transparent system to do so. Not only is this unfair on the people, but also all trees in England. The risk is thus; that England may see policy recommendations based solely on economic principles, not just timber but trading tree planting to offset development also. As long as there is public access included in package it can be safely implemented. And in the apparent urgency to protect, maintain and increase ancient semi natural woodland, it will all be lost because the budget to research a non harmful method to do so was removed. Urban & Peri-Urban Soils, destroyed beyond the point of repair? The continued disproportionate rise in our urban / peri-urban or suburban population against a rural population and the infrastructure that it requires equals the largest threat to present & future sustainability due to the continuing heavy abuse of soils. We are now in a situation where urban soils can no longer be subject to any standardised text or media output with regards gardening, landscaping or land management. The disgraceful trade in soil is one of the worst legacies we are leaving for our children, but it is very conveniently ignored, due to an ignorance of its importance. Sustainable land management, (SLM), depends on soil and despite some massive progression in terms of the realisation of threats to our environment and the consequences we as a species will suffer as a result of allowing such threats to enter our urban community through the vector of soil. Taking a transect from the centre of large population, (>250,000), will display a range of soil characteristics which alter so frequently towards the start as to render the exercise useless, the paper to illustrate the changes would have to be as long as the actual transect line itself. In one plot of a syndicate garden in the centre of Paris (1400m2) there were 14 changes so dramatic as to render any existing planting plan useless and certainly condemning what many gardeners believe to be The Soil Test, (Ph Values), to the dustbin. 9 of the soil types now present were the direct result of practitioner methods albeit unwittingly. The sheer complexities of soil combined with the unattractiveness of its study have allowed this situation to develop. I always enjoy watching landscapers or gardeners sniffing, (sometimes even tasting) soil; it is truly the mark of the professional. However their control of soil is limited to the price a client is prepared to pay, which given the ignorance involved and exasperated by a garden media who continue to uphold the myth that a ‘a healthy dose of good mulch or compost’ will cure all ills, leads to the current situation where any mention of increased costs due to soil state will have them quickly replaced by another £10 an hour ‘jobbing’ gardener. The quantity of nitrate rich soil ‘additives’ used within the urban environment exceeds dangerous levels, without even discounting for non permeable surface area. The trade in such products has increased despite a new resurgence in composting. The urban soils of a country as small as England are often as rich in nutrients as to be equivalent to the complete needs of a country three times its size. Yet in my own experience around 60% of urban soils I work with are nutrient deficient. Given the shallow consolidation found in most urban sites, in some cases actual underlying infrastructure in larger cities, you will find reservoirs of nutrient sludge, stagnant and not only dangerous to human health but containing a rich seam of maladies which can affect the most resilient of out trees, both indigenous or introduced and certainly a highway for potential new threats to enter our ecosystem. The peat argument is raging high at the moment and there is one argument which is rarely mentioned; peat is an excellent plant medium, it provides a safe solution for nurseries and subsequently for some practitioners in guaranteeing a plant short term. It is in the long term very damaging to urban soils. Containerised plants will outgrow their potted medium in varying times, but when the roots enter the inherent soil the potting medium becomes a menace. This is the point where many introduced containerised plants die. The trace elements of peat remain in the soil; this is often wrongly assumed to be beneficial. It is in reality very damaging to the soil matrix and causes immense harm and fragmentation to the soil organism ecosystem in that particular spot. There is a heightened risk of mortality to any plant that replaces the previous dead plant, which is assumed to be the fault of a disease in the medium of the previous plant. It is usually the complete collapse of the complex symbiotic relationships contained within soil, which most plant roots require for any chance of long term survival. This is no small problem in garden obsessed England. 1) The overlay of infrastructure; paving, tarmac, concrete. A recent and continuing trend to provide more hard standing for parking and also to diminish any need for weeding and maintenance should be subject to SUDS regulations, yet planning controls seem unable to enforce these measures. 2) Contamination; there is a huge rise in the dumping of materials hazardous to the environment. The rising costs of transporting to recycling centres, has led to fly tipping in locations which are deemed unattractive. Paints, solvents and petrochemical traces are now so frequent as to register as a common attribute in tree and plant mortality within the urban zone. 3) Dog and cat excrement and urine; a much ignored problem causing an average 50% rise in nitrates as well as causing mortality to a wide range of soil organisms. In some areas the problem is so great as to have caused an artificial new soil profile changing vegetation patterns irreversibly. 4) Development consolidation; the use of machinery, particularly in peri urban environments have created artificial soil pans, top soil is simply spread over the top causing erosion problems on a par with those seen following the removal of primary growth in developing countries. In many post 1960’s gardens the quantity of builders waste and the consolidation have created gardens where plants simply do not have the required depth of soil to develop. Thus problems are further exasperated and any notion of mapping and then controlling soil damage is simply a cost that is too great even when not considering industrial waste traces which have left many brown field sites far too costly an option to remediate for development, thus placing further pressure on green field sites, which due to ‘planning gains’ are made an attractive and financially rewarding option to local planners. Technology to aid quick remediation, through enzymes, microbial and mychorrizal supplementation is still in its infancy. I am a huge advocate of mychorrizal treatments having witnessed the remarkable positive changes to soil and to tree health, but it is very much a product for specific urban areas, those which are not linked to natural soils. Research to further the use of mychorrizal treatments is thwarted by the desire to utilise mychorrizal for future agricultural purposes and the required research needed is great, together with its potential damage to the existing rich and powerful chemical fertiliser industry. In the rush to ‘green our cities’ I fear we are facing a future problem where although the trees are planted and maintained after 12 years, the damage to our soils will become clearly evident above ground . The potential longevity of a tree will be reduced to such an extent that any ecological or environmental values the tree could have attained are rendered null and void. In the rush to dominate offsetting and to ensure grant flow, quoted prices do not reflect the required costs of planting and maintaining a tree in the long term let alone provide for soil study to ensure longevity of the trees. Through our ignorance of soils we are on the brink of becoming guilty of actually creating more harm for the next generation to deal with in the effort to reduce costs to ensure philanthropic money flow. We are also guilty of ignoring the fact that soils are the second largest carbon store on our planet after oceans. The obsession by many to ensure that ‘green’ really is ‘green’, could perversely prove to be ‘greenwash’ itself. And why are we so opposed to allowing natures detritus, the food for healthy soils to settle and rest on our soils? The obsession with clearing grass cuttings, removing dead wood and even using products to kill earth worms is sheer madness. The earthworm fascinated Darwin and others and is one of the most important species for human survival.